Now updated with all the latest information on all your Doctor Who favorites! The book goes beyond the story lines to examine the characters, aliens, weapons and curiosities that are all in a day's work for the Doctor. Entries are illustrated with annotated photography and specially commissioned cross-section artworks. 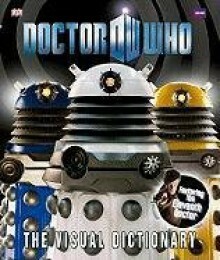 Doctor Who: The Visual Dictionary updates the entries of Davros and his Daleks, the rhino-headed Judoon and the Doctor s companions Martha Jones and Captain Jack. Forty additional pages introduce and explore all-new characters like the formidable Donna Noble, the Family of Blood and their Scarecrow Henchmen, the warmongering Sontaran and the childlike, but deadly, Toclafane.BBC and logo © and TM BBC 1996. Doctor Who logo © BBC 2004. TARDIS image © BBC 1963. Dalek image © BBC/Terry Nation 1963. Licensed by BBC Worldwide Limited. Doctor Who, TARDIS and DALEK and the Doctor Who, TARDIS and DALEK logos are trademarks of the British Broadcasting Corporation and are used under license.